Another little-known contributor to retail HVAC issues can be the product you sell. Retail clothing stores (and other types of businesses dealing with fabric) can generate tremendous amounts of fiber in the air. You don’t notice it so much (except possibly when you’re cleaning up all the dust that accumulates on every surface of the store each day!) but that fiber circulating through your ventilation system can wreak havoc on HVAC equipment. Here’s another common problem: retail space comes at a premium cost, especially here in New York City. The cost of doing business is extremely high, not to mention the cost of renovating a space. So financial concerns can lead business owners and managers to go for the lowest bidder on a retail HVAC installation job, and just hope for the best. Unfortunately, in the end you’ll probably pay more when you have to bring in someone more knowledgeable to come in and fix the problems. That’s what happened to a retail clothing establishment in New York City. The company had installed five large retail HVAC units in their flagship store in the heart of Times Square, and it didn’t take long before they started to experience issues. The units were mysteriously breaking down. The company called in the original installers, who came in to troubleshoot again and again. Finally they threw up their hands since they were stumped about what was causing the problems. That’s when the clothing company called in Arista to provide a second opinion. Our experience with retail stores, and especially clothing retailers, enabled us to determine that the retail HVAC design was insufficient to deal with all that fiber circulating through the ventilation system. Specialized condensate pumps and other parts needed to be changed out to help the system deal with the unique requirements of the environment. Now, keep in mind that at this point the original $500,000 retail HVAC installation was still under warranty, so the customer would have been within their rights to take Arista’s report and go back to the original installer and get them to make the changes we recommended. But they didn’t; instead they recognized the need to get retail HVAC experts to do the job correctly this time, so they hired us to come in and make the repairs. We did not disappoint them. We worked with equipment manufacturers to find parts specifically designed to handle the special needs of their retail HVAC system. We cleaned up the mess from the high levels of fiber coating all the equipment: the filters had become so clogged with debris that someone had removed them rather than keep up with the frequent filter cleaning that was needed! For retail stores, investing in a preventative maintenance agreement with a retail HVAC expert is the best way to make sure service is performed on schedule and with the needs of your business in mind. Here’s another tip: you’ll not only get the best pricing with a maintenance agreement, but you’ll also gain a trusted service provider that understands you, your equipment, and your business needs. And you’ll even get the quickest response times if you do experience a repair issue. Here’s another thing you might not know: all maintenance agreements are not the same. You can negotiate which equipment is covered, which tasks are covered, and whether or not parts and labor are included in the price. That way you can design the agreement to meet your specific retail HVAC needs and your budget. 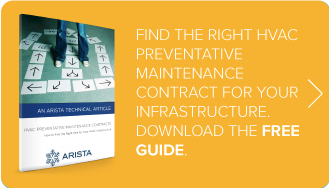 To make things easy, we’ve put together a free guide that explains how to get what you need: HVAC Preventive Maintenance Contracts: How to Find The Right One For Your HVAC Infrastructure.